Shop on-line for SYMBOLOGY (Meaningful Jewellery) here at Lizzielane with free UK delivery. Symbology – Life is Beautiful! Based in Scotland, their focus is to create beautiful, sentimental jewellery that tells a story. ‘It’s the little moments that make life big’; every single piece is inspired by spiritual symbols and made to celebrate those special moments of your life. A beautiful silver plated stretch bead bracelet by Symbology just for your daughter. 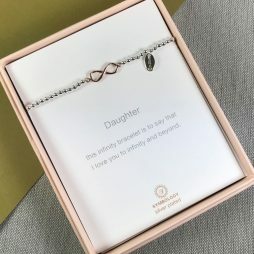 Featuring a chic rose gold infinity charm with the sentiment Daughter “this infinity bracelet is to say that I love you to infinity and beyond”. Symbology Mum & Daughter Silver Bracelet with Infinity Symbol Charm. This silver plated stretchy bead bracelet by Symbology is both sentimental and stylish. 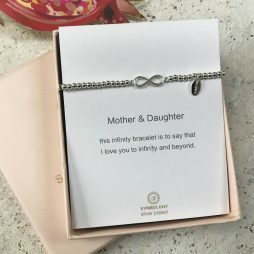 Featuring a cute silver infinity charm with the sentiment Mother & Daughter “this infinity bracelet is to say that I love you to infinity and beyond”.